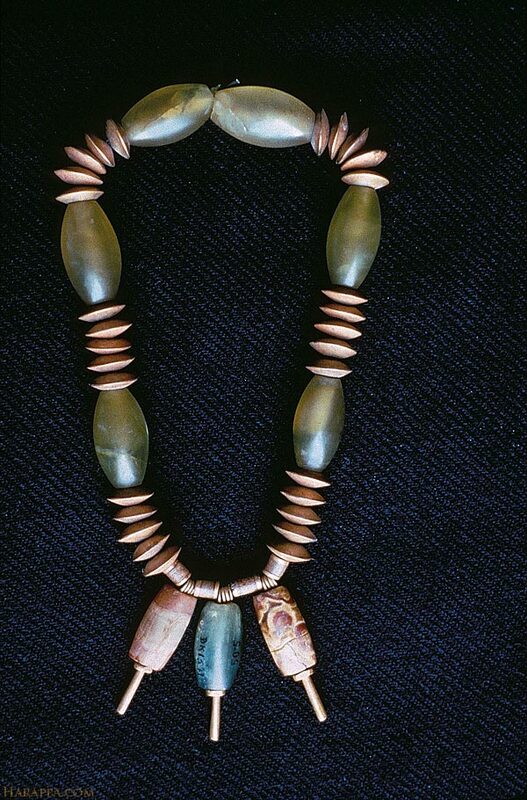 Necklace from Mohenjo-daro made from gold, agate, jasper, steatite and green stone (lizardite or grossular garnet). The gold beads are hollow and the pendant agate and jasper beads are attached with thick gold wire. Steatite beads with gold caps serve to separate each of the pendant beads. This necklace fragment is only half of the original ornament which was divided between India and Pakistan in 1947. Hoard No. 1, found in a silver vessel in DK Area, Room 2, eastern end of Block 16, Section B and C.
Material: gold, green stone (lizardite or grossular garnet, originally reported as jade) Dimensions: green stone beads: 2.0 cm length, 1.0 cm dia., gold beads 0.44 cm length, 1.0 cm dia.